Where do I use my lastminute.com voucher code? Copy the code of your choice before clicking through to lastminute.com by following our link. Once you've found the best deal and would like to proceed with your booking click ‘Book Now’. View your order summary then add any extras to your booking. Enter your details then scroll down to the discount code box. Enter your promotional code and click 'Apply’. Your savings will be automatically deducted from your booking. "Check out 'secret hotel' rooms. Here, you're just told the hotels star level and given a rough location – only once you've paid do you find out the hotel's name. This means rock-bottom prices, as hotels needn't worry about losing trade from those who go to them directly." Lastminute.com specialise in late holidays. They offer a superb range of holidays that you can jet off on just days after you book. If you're after a spontaneous beach getaway or weekend in a city, perhaps it’s just a day at the spa or a visit to London to watch your favourite musical on the west end? Whatever you need you can find it with Lastminute.com. From luxury to basics, the UK to the Caribbean, Lastminute.com won’t leave you disappointed, in fact, they’ll leave you happy and excited with incredible deals, hassle free booking and plenty of wonderful getaways. When it comes to accommodation Lastminute.com hotels don’t disappoint. You can find hotels in beach locations, city centres, popular destinations in the UK and hotspots throughout Europe and what’s more, all for a thrifty price. Lastminute.com will leave you excited for your stay with 22 unusual hotels on offer and hotels fit for a queen that ooze luxury and prestige. With new deals each week and the Best price Guarantee you are sure to be provided with the best packages and money saving offers on the market. Explore the Lastminute.com flights and be amazed at the superb flight deals up for grabs. Whether it’s a business trip or a holiday, lastminute.com has just the ticket to suit your budget and schedule. Affordable flights to popular destinations around the world are awaiting you as well as that well needed me time. Alongside the low-cost price tag, booking your flights is hassle free! And with the abundance of deals to browse and select you’ll find yourself saving your money for the more important essentials like cocktails and ice cream. 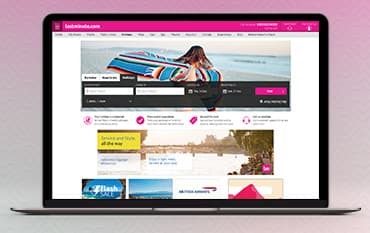 Lastminute.com has something to suit you and all the family when you book flights online, whether it’s adventure in the sun, exploration in a historic town or chill out time in a glamorous hot-spot, booking a cheap flight has never been easier. Take some time out and travel to your perfect place with lastminute.com. Lastminute.com Holidays offer amazing value on some of the best all inclusive deals and package holidays. Whether you’re after that heavenly beach paradise; sun, sand and blue skies, to escape the dreary English climates. Or, perhaps the winter sun you’re longing for? Maybe a Skiing holiday is more your type? No matter what, Lastminute.com caters for all and has an exciting array of destinations to choose from with affordable price tags to match. Travel where you desire and pay the price that you can afford. From holidays in France, Spain, Turkey, Greece, Italy, Portugal and Croatia, to exotic and luxury destinations further afield, like Cape Verde, Cuba, the Maldives, Goa, Mauritius and Barbados. What are you waiting for?! Lastminute.com offer a staggering amount of tickets to the top London theatre shows. With deals and packages to help you save money, you can find yourself paying a good price for more than you bargained for. London’s glittering West End is home to arguably the world’s best theatre scene, with millions of visitors flocking to the area to enjoy everything from blockbuster musicals to crowd-pleasing comedies, classic revivals and cutting-edge drama. You can join them with the selection of last minute theatre tickets and be amazed by the power of theatre. Lastminute.com Top secret hotels offer stays in destinations from London to New York for a fraction of the price with the best deals. Live it up in fabulous destinations, staying in luxurious hotels in some of the world’s most beautiful cities such as Barcelona, Paris, and Amsterdam and do it all for less than you expected. Find sales with over 30% off with Top secret hotels and enjoy a short break in an amazing location. With the click of a button from your mobile and laptop, you could soon be heading off to paradise, so why not book with Lastminute.com and enjoy an array of fantastic weekend breaks. Some of the most exquisite, historical, exciting and cultural places in the world are just a short trip away and offer the perfect scenery, setting and activities for a romantic weekend break with your partner. Explore exclusive shopping avenues and admire famous art work in some of the world’s most renowned galleries. Treat yourself to a spot of afternoon tea or light lunch to break up your wanderings. Or if you just want to chill, head to a peaceful country area where you can get away from it all in any town, city or continent that you want. To contact lastminute.com please call 0800 083 4000. How can I manage your booking? To manage your booking please create an account or log in to your account. It is necessary to travel with a valid ID and all the necessary travel documents and visas required for your trip. For further details please click here. lastminute.com offer huge savings on city breaks, hotels, flights & experiences - to destinations such as Amsterdam, Paris, New York, Rome, London, Edinburgh, Dublin, Prague & Barcelona to name just a few. Using one of our lastminute.com Discount Codes you can save money on theatre tickets, spa days, city breaks, hotels, gift experiences and much more. Whether you're booking an impromptu trip to Barcelona or taking in the fabulous views of London from The Shard, lastminute.com has last minute deals, car hire, restaurants, theatre tickets and experiences for all occasions and interests. We are constantly on the hunt for Discount Codes for lastminute.com to help you with your money saving. Our experts check dozens of sites for secret codes including NHS discounts, student sites & social media channels saving you time & money!